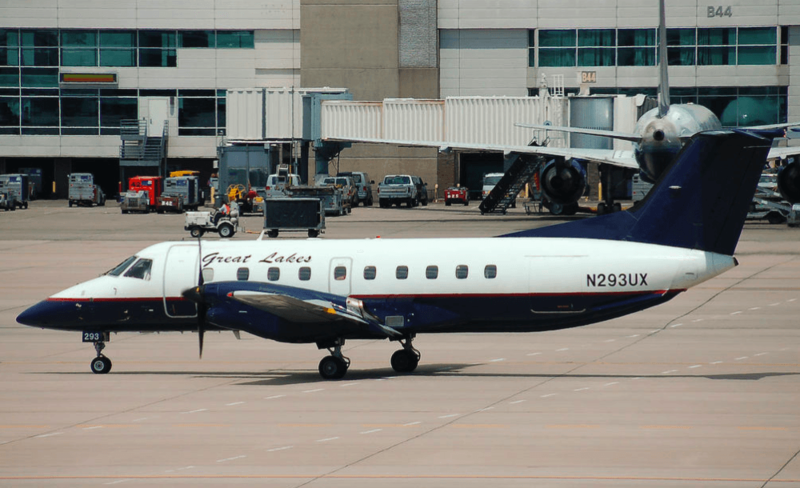 With its modest fleet of 38 turboprop aircraft, Cheyenne-based Great Lakes Airlines poses no major challenge to big national carriers like United, Delta, and Southwest. But with the help of Congress, Great Lakes soars above all others in the amount it receives in federal assistance – $58 million in the last year alone — making it the most subsidized air service in America. In 2012 filings with the Security Exchange Commission, Great Lakes reported that 42 percent of its total revenue comes from the controversial Essential Air Service program (EAS) under the federal Department of Transportation. Between 2001 and today, this number has risen from as low as 19 percent to as high as 50 percent. Even before the current federal spending sequestration era, Congressional conservatives — most notably Arizona Republican Sen. John McCain — have repeatedly tried to kill the $212 million Essential Air Service program, describing it as a conspicuous waste of money during a time of mounting national debt. “To put it bluntly, the Essential Air Service is not ‘essential,’” McCain said regarding his defeated proposal to eliminate the subsidy in 2011. Under sequestration, the political pressures on Great Lakes and other Essential Air Service recipients are likely to increase. Great Lakes was incorporated in 1979, the year after Congress deregulated airlines, and in 1985 the company took on its first subsidized EAS route. By the 2000s, Great Lakes had embraced a business model built largely on federal subsidies granted for flying to small towns that other airlines refused to serve. That model may be threatened by sequestration under the Budget Control Act, making the company’s already tight margins even tighter. Others say Great Lakes already weathered its toughest time between 2000 and 2002, when the company lost millions during an industry-wide slump caused by a recession, high fuel prices, and 9/11. 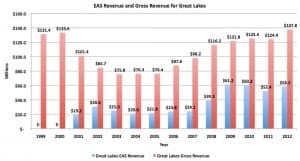 Airline consultant Nate Vallier says that if EAS were discontinued, Great Lakes could still survive by greatly reducing its flights and relying more on profitable routes to remain in business. He also predicts the subsidies would be replaced by federal airport block grants and locally-sponsored revenue guarantees. “If EAS goes away I think the communities will get involved, and Great Lakes will morph into their ninth life,” said Vallier. In the past other airline consultants credited the company’s resilience in tough times to the leadership of company owner Doug Voss. 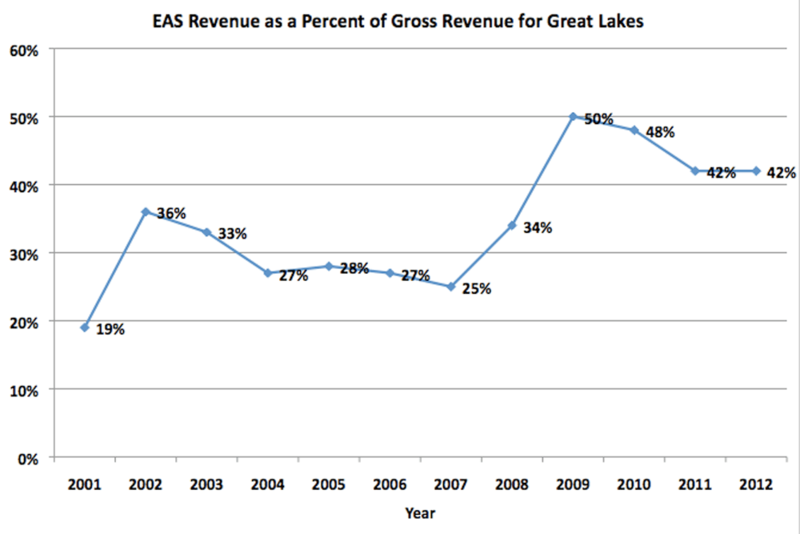 Great Lakes officials, who describe their EAS revenue as “public service,” declined to speak with WyoFile. Yet the company’s SEC filings show they are keeping an eye on sequestration of EAS funding. 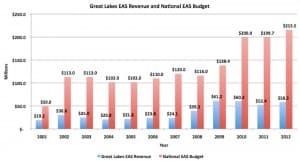 Given the current debate over the federal budget, Great Lakes airlines does face uncertainties about the EAS program. 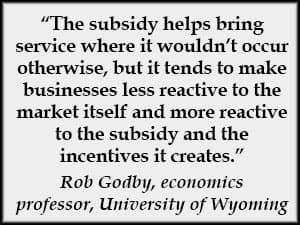 Yet changes in the program may enable towns like Laramie, Worland, and Cody — the only places in Wyoming served by EAS — to create more effective local subsidies that demand better prices, schedules and reliability. In the meantime, Great Lakes will likely continue its nimble adaptations to the challenges of the air industry. The EAS program arose following deregulation of the airlines in 1978. Prior to that, certificates issued by the FAA required airlines to provide a certain standard of service to small towns. Many Wyoming residents remember flying on large, comfortable airliners from places like Sheridan and Cheyenne before deregulation. After deregulation, the airlines concentrated their flying around more profitable hubs, leaving rural towns with less desirable air service. Historically, Wyoming’s GOP Senator Mike Enzi has joined with Democrats in Congress to keep EAS subsidies flowing on the principle that the payments benefit smaller communities that would not otherwise have access to passenger air service. But Barrasso’s predecessor in the Senate, U.S. Sen. Craig Thomas, was a longtime EAS supporter. Rep. Cynthia Lummis (R) voted against both an increase and a decrease in EAS funding last year, but told a Bloomberg reporter that she’d be interested in seeing the EAS cut. Enzi’s staff declined to provide a comment to WyoFile for this story. Staff for Sen. Barrasso and Rep. Lummis did not respond to requests for comment. Today, only three Wyoming towns, Cody, Worland, and Laramie, are among the 117 communities in the EAS program nationwide. But even those subsidies are modest. 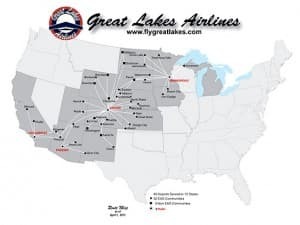 Great Lakes has only one EAS route in Wyoming, which serves Worland on a subsidy of $1,987,148 ($337.55 per passenger). Great Lakes’ competitor SkyWest serves Cody with an EAS subsidy of $352,058, or $6.39 per passenger. Until last fall, Great Lakes flew into Laramie for a subsidy of $1,635,346 ($120.87 per passenger), but SkyWest now operates that route. None of these rates compare to the $1,637 per passenger received by Great Lakes in 2012 for flying to Ely, Nevada. After several years as the poster child of Essential Air Service excesses, the Ely route was cancelled from the program in 2012. Wyoming’s main benefit from EAS appears to be that Great Lakes, which moved here in 1999 from Spencer, Iowa, and Minneapolis, Minnesota, has its corporate headquarters and some of its repair facilities at the Cheyenne airport. How that happened is a case study in government efforts at diversifying business in the state. In 1999, Wyoming was finishing up a decade of lackluster economic growth, made all the more painful by the fact that the rest of the mountain West had boomed. In response to the state slump, the legislature created the Wyoming Business Council, tasked with economic development for the state. It was the Business Council that enticed Great Lakes to come to Cheyenne by offering a variety of incentives, ranging from tax breaks on airline parts to building a $4.4 million headquarters and offering favorable terms on the lease. Reporter Jessica Lowell of the Wyoming Tribune Eagle was the first in the media to hear of the Great Lakes move in 1999. She was sitting in a meeting of the Senate Revenue Committee when she heard discussion turn to an unexpected topic: tax exemptions for airlines parts. Sen. Hank Coe (R-Cody) revealed that the exemption was part of a package to lure the maintenance facilities for Great Lakes Airlines to Cheyenne. In April 1999 Lowell published her first story on Great Lakes. From that point on she reported in-depth on the process of luring Great Lakes to Cheyenne, creating a detailed record of the company’s performance. According to Lowell’s reporting, the $4.4 million in taxpayer-funded incentives paid for a 24,500 square foot hangar, a ramp and a 20,000 square foot building to house the airline’s corporate headquarters. In return Great Lakes offered to relocate 40 full-time maintenance jobs for a total of 200 employees to Cheyenne. 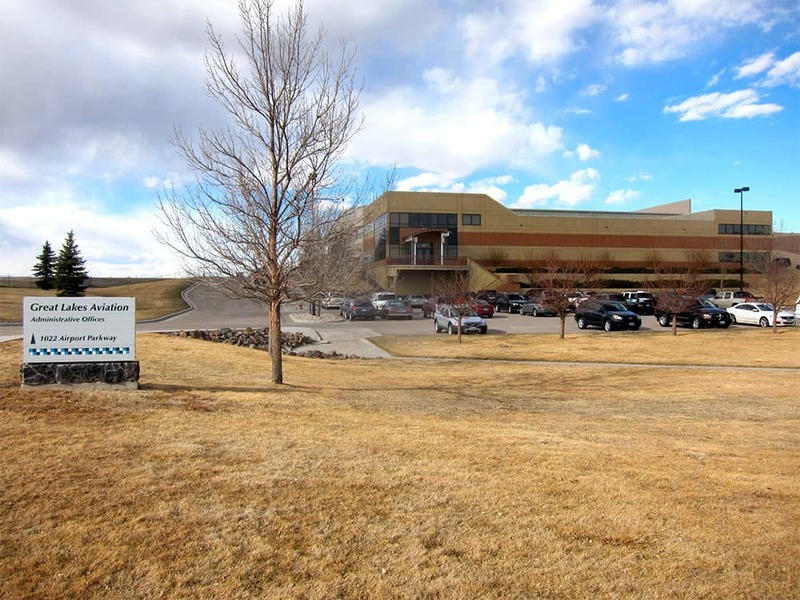 The Wyoming Business Council helped complete the lease deal with Great Lakes, in collaboration with airport manager Jerry Olson and the Cheyenne Airport Board. The lease granted favorable rates that would be raised to a much higher level if Great Lakes failed to live up to promises of maintaining a spare airplane for use in Wyoming, and that it provide service to Jackson, Cody, and Casper if other carriers pulled out. Great Lakes also had to provide non-stop service to Denver, and stable air service in Wyoming. The original monthly rent for the headquarters building was set at $3,800, a number chosen because that’s exactly what Great Lakes paid to rent its facility in Spencer, Iowa. Wyoming beat out at least two other states trying to lure Great Lakes because it offered to build a facility with input from the company, and because it did so using grants, rather than long-term loans. The Wyoming legislature, meanwhile, did its part to entice Great Lakes to Cheyenne, by granting the tax exemption for aircraft parts in W.S 39-1-105 (a)(viii)(J). Gov. Jim Geringer told the Wyoming Tribune-Eagle that the exemption wouldn’t hurt revenue, since sales tax wasn’t being collected for airline parts prior to the passage of the exemption. In 2003 the legislature introduced a bill to expand the aircraft sales tax exemption to any plane maintained in Wyoming, not just those scheduled for regular service. Rep. Pete Illoway (R-Cheyenne) and Sen. Hank Coe (R-Cody) were among the sponsors of the bill. From start to finish, the deal to bring Great Lakes to Cheyenne took about eight months, with the final agreement signed on May 26, 1999. The deal required collaboration from multiple entities, including Great Lakes and the airport, the county, the city, the Business Council, the legislature, the State Land and Investment Board, the Department of Transportation, the Treasurer’s office, and the Governor’s office. Even as the company committed to coming to Cheyenne, some had doubts. After losing money in 1996 and 1997, Great Lakes made money in 1998 and 1999. Coverage in the Casper Star-Tribune questioned the wisdom of attracting a company that had recently been in the red, and tried to verify how many jobs would be created by moving Great Lakes. The paper correctly noted that Great Lakes hadn’t fully committed to moving its headquarters from Spencer, Iowa. Governor Geringer came out against the naysayers. Company owner Greg Voss confirmed that Great Lakes had promised to move its maintenance facility and Denver-based management to Cheyenne, but not necessarily its entire headquarters. The company wanted to maintain flexibility of having its Spencer headquarters in case business expanded in Chicago. As time went on, Great Lakes brought more of its operation to Cheyenne. 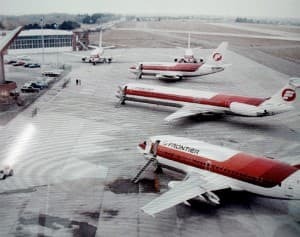 In December of 1999 the company leased 60 percent of the airport-owned building that housed online company Preston University. Great Lakes needed space during the time the hangar and headquarters were being built. The company also moved its pilot training program to Cheyenne in 1999. In February of 2000 it moved its accounting staff from Spencer to Cheyenne. Early in 2001 the company moved maintenance for its fleet of 30-seat Embraer Brasilias to Cheyenne, which brought another 20 jobs. By that time Great Lakes had moved its headquarters from Iowa to Cheyenne. When Great Lakes moved to Wyoming, it flew to every airport in Wyoming except Jackson, Cody, and Casper. Shortly after signing its deal it took on service to Casper. The capture of Great Lakes from its original headquarters seemed to prove the success of the Wyoming Business Council strategy, and a sign of hopeful change. “Could this be the open door Wyoming has been waiting for? Only time will tell. Many economic development officials say Great Lakes’ move to Cheyenne could be the catalyst that pushes the state to new economic heights. Let’s hope it is,” intoned the Cheyenne newspaper. In the end, it wasn’t aviation but the natural gas boom in the Powder River Basin and Upper Green River Basin that resolved Wyoming’s budget woes. The high hopes for Great Lakes as an economic savior came down to earth, yet the company has held its own. Great Lakes has managed to turn a profit while continuing to serve marginal markets. And certainly it has an economic impact. On a recent visit to Cheyenne, WyoFile counted around 200 employee cars in the parking lots of the Great Lakes building and the Preston Building, nearly the exact number expected in 1999. To keep flying in the turbulent air of the small-market air service is no small feat. Companies like Great Lakes survive only by cutting every cost possible, from flying small planes, to paying its pilots minimal wages, and maximizing usage of its fleet. With all those costs controlled, the company has very little wiggle room. Yet despite a difficult period of debt restructuring with aircraft leaser Raytheon in 2007, the company hasn’t lost money since 2002. Between 2005 and 2008, the company’s gross revenue grew by more than 10 percent each year. In 2012, Great Lakes brought in a record $137 million in gross revenue, though the net profit stood at just $2.9 million. 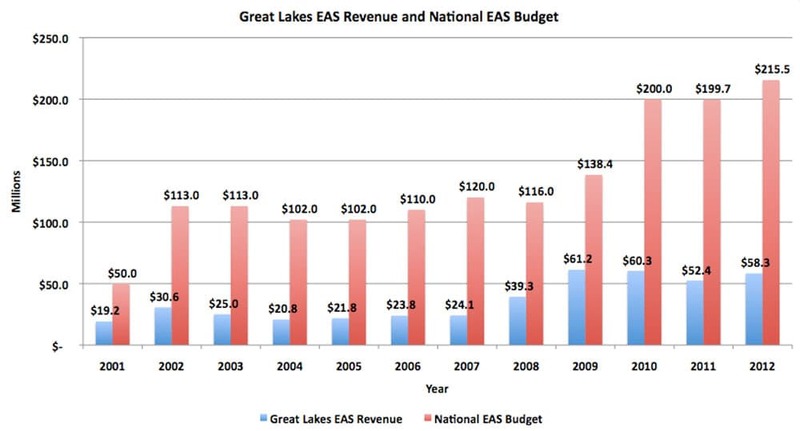 Part of Great Lake’s modest growth has come from increased reliance on the EAS subsidy that began after the arrival of CEO Charles “Chuck” Howell. Every turboprop aircraft the company owns is relatively cheap to fly, and they all meet the guidelines for bidding on Essential Air Service contracts. That means the company is often “the last man standing” when it comes to competing for EAS routes, according to airline analyst Nate Vallier. By being a strong competitor within its niche, Great Lakes has built a regional network that stretches across much of the central U.S. Having the headquarters in Cheyenne has brought economic activity that Wyoming’s own passenger base could never support on its own. Great Lakes’ survival in the difficult air service business speaks for itself. Whether the company has “stabilized” air service in Wyoming is still up for debate. It’s no secret to Wyoming residents that the company has challenges with customer satisfaction. Passengers on Great Lakes Airlines routinely report delayed or cancelled flights. The system is so tightly scheduled that a mechanical issue that grounds one plane can have a ripple effect across the network, causing delays that last for days, completely scrapping an individual’s travel plans. Among economic development leaders in Cheyenne, the feeling toward Great Lakes is palpably different. “We are thrilled to have them here,” said Randy Bruns of Cheyenne LEADS, an economic development corporation. While he acknowledges the company’s reliability problems, he is troubled by the attitude some Wyoming residents take toward their in-state airline. “I think instead of celebrating and helping an industry that’s here now, we’ve sometimes beat up on them. To me that’s not the way you treat an industry that’s here,” Bruns said. But for residents who have missed a connection because of a flight delay, it’s hard to be forgiving. So while the airline has stabilized its finances and managed modest growth, it has not necessarily attracted a loyal customer base in Wyoming. Many airline passengers opt to drive to out-of-state airports rather than pay the high prices for tickets to Denver and risk a flight cancellation. The industry term for passengers bypassing local flights is “leakage.” In Sheridan, leakage of passengers to airports in Billings, Casper, Rapid City, and Denver is more than 70 percent. Leakage in Cheyenne is about 90 percent. Ironically, it seems that the Essential Air Service subsidy designed to boost air service in rural areas has resulted in service that people don’t want. And even though most of Great Lakes’ routes in Wyoming aren’t subsidized, the company as a whole has adapted to serve EAS markets, with consequences to reliability. However, not all subsidies are created equal. A major problem with EAS is that it doesn’t encourage local communities to build relationships with the air service provider. 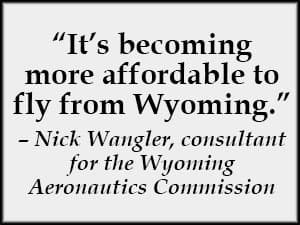 “If you are taking a subsidy to do something and you are not actively involved in managing it, then you end up getting what you pay for,” said Nick Wangler, a consultant for the Wyoming Aeronautics Commission. Wangler helps manage the Wyoming Aeronautics Commission’s Air Service Enhancement program, which provides revenue guarantees to airlines. So far the program has provided funds to eight local air service groups, which then set performance benchmarks in collaboration with the airlines. If the airline fails to reach the passenger targets it estimated, the local community pays for the lost revenue. That relationship creates an incentive for the local community to promote air service. At the same time, the revenue guarantees require companies to maintain competitive fares, schedules that match with connecting flights at hubs, and a high standard of reliability. Since 2009-2010, the state has appropriated $3 million per biennium toward the program. The total spent on Air Service Enhancement since 2003 stands at $21 million. “That’s brought in 2 million passengers to the state and an economic impact of $256 million. It’s a payback of 12 to 1,” Wangler said. Wangler has compared Wyoming’s air market from 1997-2003, before the ASE program, and from 2004-2012. In the period before the program, he said Wyoming’s traffic was down 2 percent. Then from 2004-2012 it went up 36 percent. During the same time U.S. domestic traffic growth has risen from 8 percent to 9 percent. Wangler added that in 2003, Wyoming passengers paid 37 percent more than other domestic flyers. Today they only pay 8 percent more. “It’s becoming more affordable to fly from Wyoming,” Wangler concluded. The key to that success is active management of the state program. Wangler says he speaks with air service providers every week to address any issues. Those relationships create accountability. 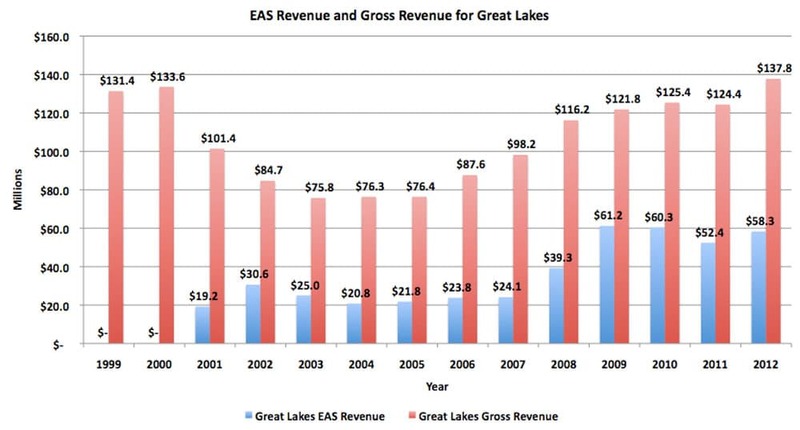 Interestingly, Great Lakes hasn’t made a revenue guarantee with a Wyoming community since 2005. Many of its Wyoming routes, like the Sheridan-Denver flight, operate without a subsidy. In Laramie, airport Manager Jack Skinner says his community may not need the EAS subsidy at all. “In my opinion, there is enough business there that it could stand on its own without the subsidy. I know the margins are tight on the airline industry. If you have a reliable product that is on time, people are going to use it and you can fill those planes,” he said. While the EAS program isn’t perfect, Skinner says he believes its still a good program. “It provides small communities like Laramie to be connected with the rest of the world,” he said. Industry observers like Vallier say the days of the current EAS program are numbered. Soon, perhaps five years from now, the program may cease to exist, and could be replaced by grants to local airports, which will allow communities to make more decisions about how money is spent. For Great Lakes, the potential elimination of EAS won’t kill the airline, but it will bring about major changes. 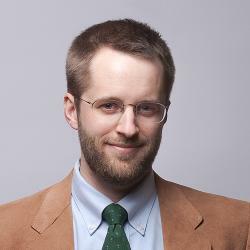 Editor’s note: WyoFile co-founder Rone Tempest contributed to this story. Yes, DeweyV. I can name a state where you have to fly out of state to fly to its capital…..Arkansas. From Fort Smith or Fayettevelle you have to go through either DFW or MEM. Very well-researched story, Greg. The only concern not brought out is how these financial cut-backs and cost saving measures will affect the safety issues of the airlines. I came back on a flight from Den to Sher, and upon entering Sheridan, we circled Sheridan County for 2 hours. They couldn’t tell if the landing gear was actually down, the landing gear light was out, etc. Story ended well with the light being out and the gear down. If that was the only event to have happened to that plane, fine. But it happened more than once. Since the essential safety of the service is paramount, how will it be affected with the cutbacks? I consider flying in and out of Sher a wonderful service–if it works, but realizing a traveler has to be flexible, patient and adventure-oriented. The recruitment of the company happened after Gov. Jim Geringer appointed John Reardon as the CEO of the new Wyoming in October 1998, Reardon began talks with Voss to recruit Great Lakes from Spencer, Iowa, in an effort to foster better air service in Wyoming. However, Reardon declined to say in early 1999 whether the WBC’s board even needed to know about the company’s condition before it voted to appropriate $1.5 million to help lure the firm to Wyoming as part of a package to finance a maintenance facility and headquarters at the Cheyenne Airport. The whole thing got much weirder after that. Reardon, who showed his loyalty of promoting Wyoming as a great place to live and do business, meanwhile had bought a house in Fort Collins. The Legislature’s Joint Appropriations Committee declined to fund the WBC in early 2000. He resigned soon thereafter. Since good deeds are blessed, Reardon was named to GLA’s board of director a few years later. At some point, I was lounging in my living room in my little house and took some odd comfort that I had more net worth than this airline. Just think what I could have done with some federal “Help Keep Casper Beautiful” subsidies. As a postscript, I was covering a trustees meeting of the Casper/Natrona County International Airport when the airport’s director announced Great Lakes was pulling out. And these establishment/business/civic leaders broke out in applause. Great Lakes is based in Cheyenne for one reason and one reason only…Wyoming’s beneficence. We naively provided them tax breaks and financial ” incentives” to set up shop here. Makes me ask if there are more promising careers in Aeronautical Accounting Tricks, since Great Lakes is for all PRACTICAL purposes based in Denver, one state over. The old rusty saw is quite true : if you die and leave for Heaven , you are still going to have to change flights in Denver. I can’t add anything to this theme that Greg Nickerson hasn’t already put in succinct black and white wordage, except maybe this: Can you name any other state in the Union where a resident who wants to fly to their own state capitol has to leave the state and change planes to do it ? Great Lakes for all its generosity from Wyoming taxpayers still doesn’t have direct flights to Cheyenne, its home base, from any Wyoming air terminal . Such an interesting story! Wow, so many complex issues are laid out here– thanks, Greg & WyoFile! I do wish Wyoming politicians & folk would stop the anti-government posturing; clearly, little gets done without big government handouts, direct grants, subsidies, tax incentives, etc., so why not be honest & be grateful? Still, I can’t help wondering if all the tax money given to corporations wouldn’t be better spent directly improving the lives of Wyoming people– I do not think corporations are people, my friend. I have “enjoyed” the very, very bad service Great Lakes provides to my town, and I find I can live without it– I fly out of Salt Lake now.